National mobilization in Ferguson: Justice for Michael Brown! The ANSWER Coalition encourages its supporters to participate in this important action. The call to action below was reposted from the official website for the events. Below is a tentative schedule of events. Click here for the latest updates. Buzz Westfall Justice Center (100 S Central Ave.) Clayton, Mo. Droves of people, many of them young and black, took to the streets of Ferguson to demand justice for Mike Brown. Millions stood in solidarity as protestors were met by a brutal and militarized response by local police departments. Our country can no longer deny the epidemic of police violence facing Black and Brown communities. Mike Brown is now part of a long list of people like John Crawford, Ezell Ford, Eric Garner, Oscar Grant and countless others who have been unjustly killed by police. Their lives mattered. 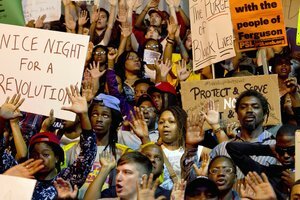 Join Hands Up United, Organization for Black Struggle, Missourians Organizing for Reform and Empowerment and our partners in Ferguson from October 10-13th for a weekend of resistance. We’re hosting a series of public events—marches, convenings and panels— to build momentum for a nationwide movement against police violence. We will gather in Ferguson, but the world will hear our call for change.